Bobbi Kumari is a fascinating and multi-faceted artist. She is primarily a fashion designer and entrepreneur but UNVEILING 2016 saw her contributing a compelling spoken word piece to Emily Barroso‘s production, “Children of the Resurrection”. Bobbi Kumari, a graduate from the London College of Fashion is founder of Living in Light – an online Fashion and Lifestyle brand. Following on from a career in teaching Fashion, Bobbi went on to set up Living in Light to provide edgy, original, vibrant fashion products with a life changing message. Celebrating the unconventionally beautiful, the brand seeks to enhance personal confidence through creative mediums including film, fashion, literature and education. Living in Light also offers tailor made Fashion Workshops and a Free Image Consultation service. Living in Light also strives to promote the message of Sexual Purity. For Bobbi, Living in Light is so much more than a brand – it’s a lifestyle…one that she hopes will inspire others to live lives that truly radiate. 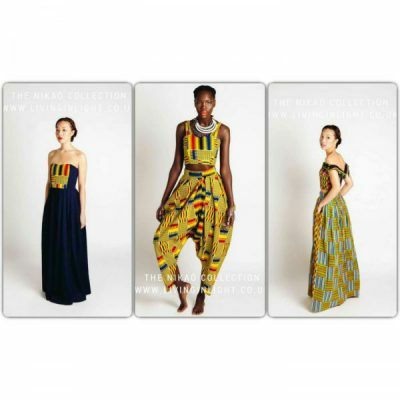 The new Nikaó collection by Living in Light features a delicious combo of signature African Print and Indian Cotton Bianca style pieces as well as a new denim range and some casual separates. Named after the Greek Word for Conqueror, the collection charts a season of perseverance, of dancing in the face of challenges and of overcoming. The pieces are designed to evoke a sense of steadfastness, strength, tenacity, joy and peace. Do view and/or purchase from the new collection via www.livinginlight.co.uk. To stay connected on social media, follow: livinginlight1 on Twitter and Facebook; and livinginlightuk on Instagram and Tumblr.